The KONG Senior is a variant of the KONG Classic, made especially for older dogs. This toy is made of soft but very strong rubber and therefore more suitable for the teeth and jaws of senior dogs. KONG Senior is available in three sizes: small, medium and large. When dogs get a little older, chewing on toys can become a little more difficult. That is why KONG has created a variant of the KONG Classic for older dogs. KONG Senior is tailored to the older dog's teeth. This toy is made of the distinctive strong natural rubber used for the KONG Classic, but softer. This makes it easier for older dogs to chew on the toy. 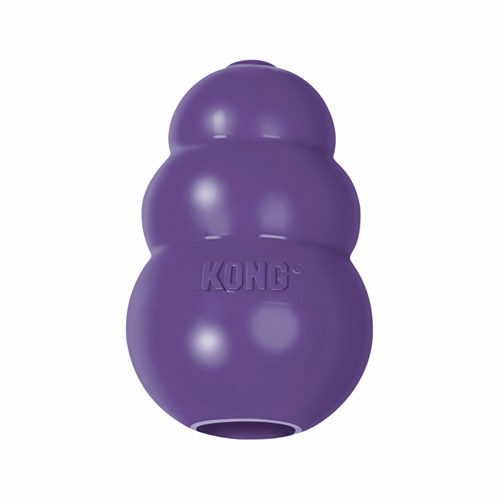 Just like the KONG Classic, you can fill the KONG Senior with dry food, treats or KONG Stuff'N. KONG Senior is available in three sizes: small, medium and large. Have you used KONG Senior before? Let us know what you think about this product.